It’s certainly been all about the asparagus lately, but I’m afraid you do have to make the most of it while it’s in season. You may be pleased to hear, though, that this is the last of the Asparagus recipes. Asparagus Soup. It all looked pretty straightforward, and my initial plan was to make this for lunch one day over the weekend. Circumstances conspired against me though, and we ended up having it on the Monday evening. So, no longer a lunch, but now the main meal of the day. Well, at least the recipe said “Serves 6”! The first thing needed was a “light chicken stock”. That’s easy enough, I did this in advance on the Friday. A few chicken wings, some carrot, onion and celery, simmered for a couple of hours. It smelled delicious. Monday evening, I read through the recipe again. There was about 50 minutes cooking time. A little chopping too. It wouldn’t take much more than an hour or so to make. Or so I thought. 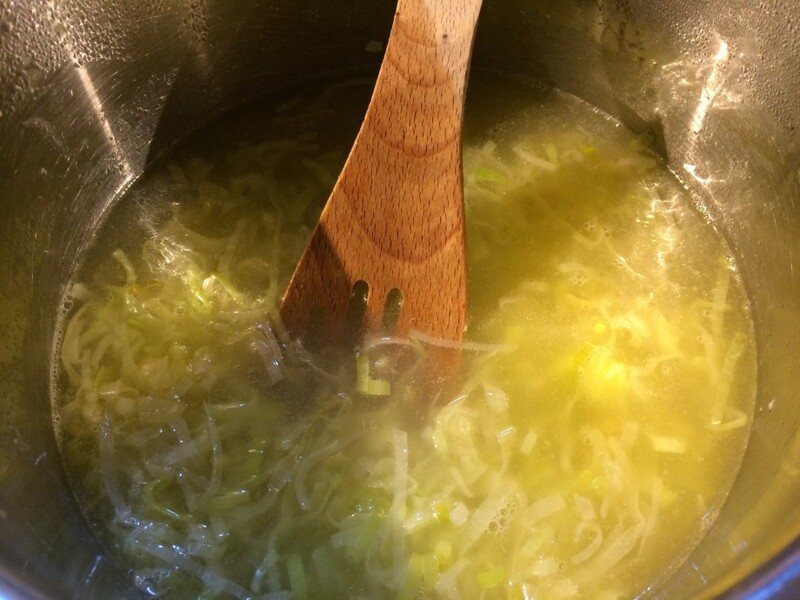 It starts off with some leeks, chopped and cooked gently in butter until soft. So far, so good. Then add the chicken stock, and simmer for thirty minutes. Easy. Next, season, add potatoes and asparagus (reserving some of the tips for later), and cook for another twenty minutes. 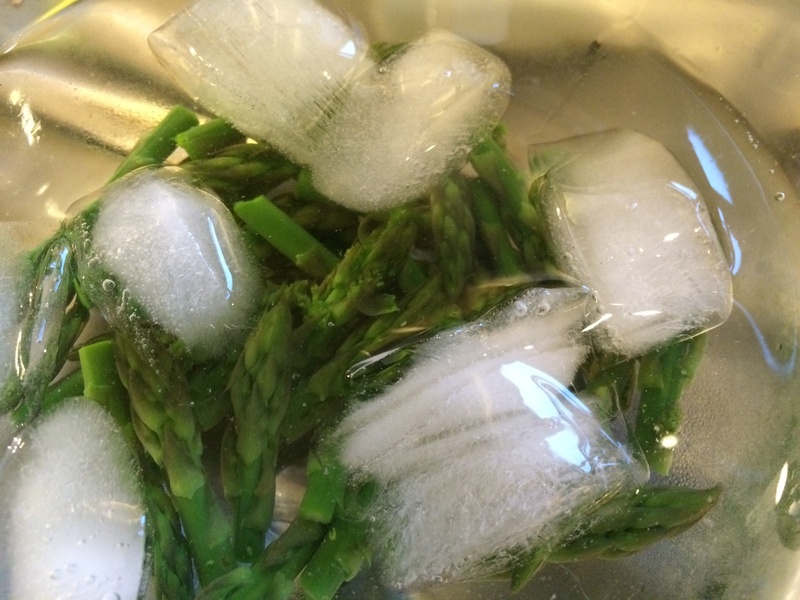 Whilst it was cooking, I also cooked the reserved asparagus tips in a pan of water, and then cooled them quickly in some iced water and put them to one side. My fifty minutes cooking time was up, the soup was nearly ready. I just needed to blend it until it was smooth. So, I blended it, and then noticed the instruction “then push it through a fine sieve into a clean pan”. I’d missed that when I first read through the recipe. Oh well, sieving soup is a little tedious, I thought, but it shouldn’t take too long. I was wrong. Very, very wrong. 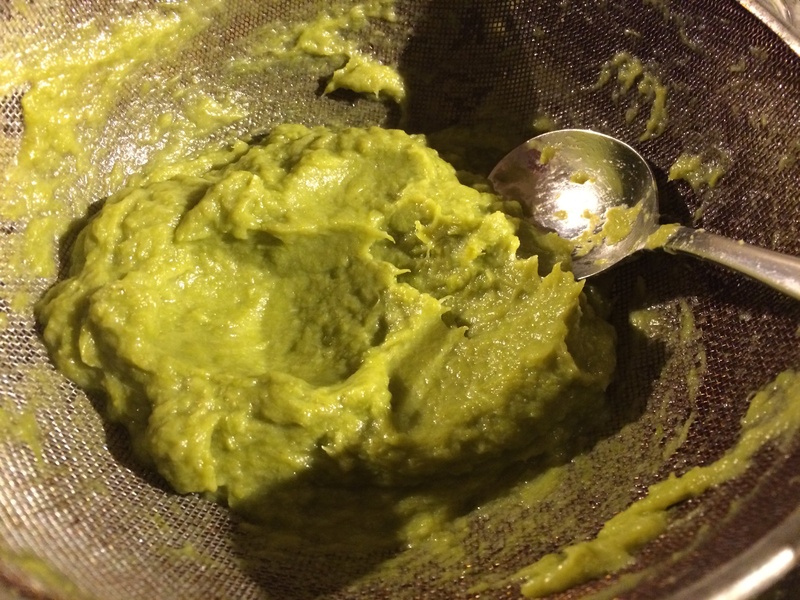 It seems that blended asparagus is really difficult to push through a sieve. I spent what felt like forever pushing away with the back of a spoon. I got most of it through, but was left with what felt like an enormous amount of asparagus pulp that was simply not going to pass through my sieve. Well, that would have to do – I was hungry. Final steps: stir in some cream, then reheat soup, adding the cooked asparagus tips and some lemon juice. Serve in hot bowls, sprinkled with chives and cayenne pepper. Well, it may have taken rather longer than I originally anticipated, but I have to say this soup was very, very good. Soft, creamy texture, with a gentle, but excellent, asparagus flavour. Even with the pain of sieving, I think I will have to make this one again. I’ve never had asparagus soup before. What an oversight! It’s delicious. Delicate flavours with a creamy texture and beautifully crisp little heads in the bottom which were cooked and cooled separately to ensure they didn’t go soft. 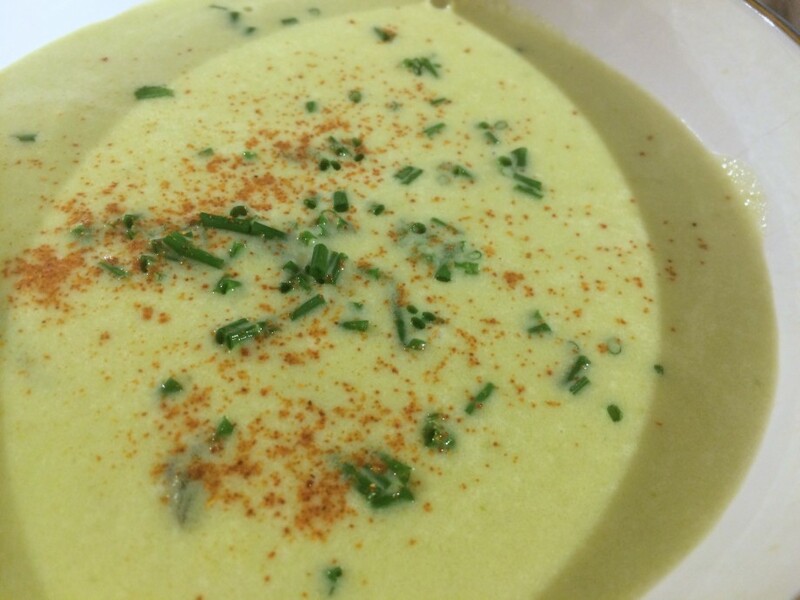 It’s a subtle soup and ideal as a starter for a refined meal. We had it for dinner with hunks of fresh made bread and lashings of butter, but perhaps we should have had fine slices with the crusts cut off! It was apparently a pain to make. I say next time just blend it and leave the sieve in the cupboard, but there should be a next time, it’s really, really nice soup. Sounds brilliant! Despite the sieving part, I might actually give this a go! Does it have to be green ones? There seems to be far more white-asparagus where I live but they taste and feel a bit different. Or are they just different maturities of the same veg? Thx. I’ve only ever tried it with green asparagus, so I can’t really say how it would work with white. To be honest, I’ve never eaten white asparagus – I believe it’s the same thing, but just grown in different conditions. I’m sure it’s worth trying though! © 2014 David Wilkinson. All rights reserved.